Went to the Green Bay RV show on Saturday instead of Sunday to avoid the predicted temperature drop — mid-30’s to single digit. This was our 3rd or 4th RV show and it seemed well attended. We toured both exhibit halls and it looked like most RVs on display were tow-behinds or 5th wheels. There were very few pop ups and Class As. Nevertheless, we drifted to the only Class A dealer at the show, King’s Campers out of Wausau, WI, who had three Tiffin Class A motorhomes on display. Two of the Tiffin’s were 4-slideout, Freightliner chassis diesel pushers: a 39-foot, 340HP Cummins 2013 Allegro RED (list $228K) and a 400HP Cummins 42.6-foot 2012 Phaeton (show pice $240K). 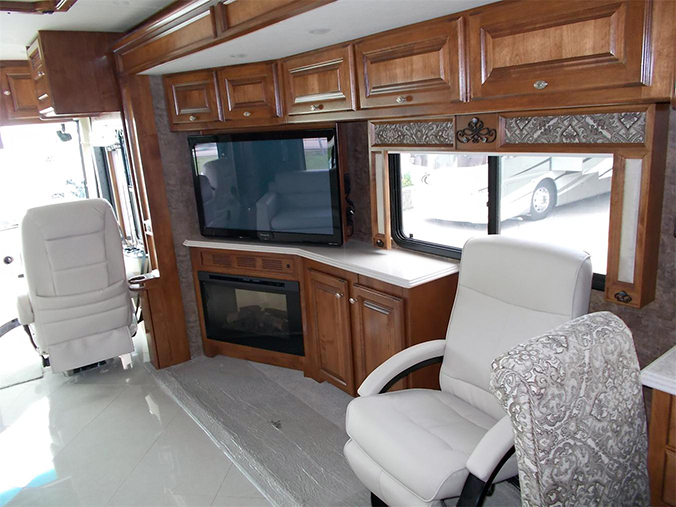 The rear full bath is a great feature and this Phaeton also features a porcelean-tiled living room that includes a fireplace topped with a large flatscreen. Met the owners of a campground on Washington Island in Door County. They said that the ferry to the island can take over RVs of any size. Mmmmmmm . . .